Two decades after Belle broke the spell and Beast returned to his human form, they created a nation for their kingdom and the surrounding kingdoms while their villainous counterparts were banished to their own island. There, they lived under a dome that separated them from the castles they once terrorized. Their magic was gone forever. Not only did they have to suffer the consequences of trying to outdo good, but their children had to suffer as well. 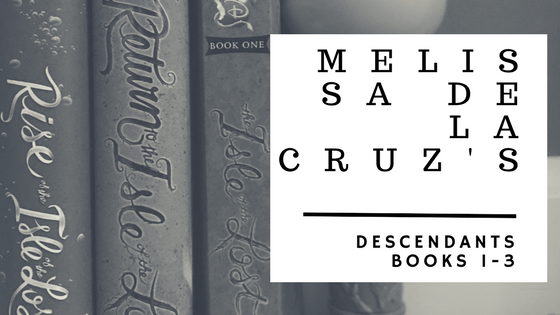 The Isle of the Lost, the first Descendants novel by Melissa De La Cruz, prequels the Descendants film that premiered on Disney Channel in 2015. It introduces the four main villains – Mal, daughter of Sleeping Beauty’s Maleficent; Evie, daughter of Snow White’s Evil Queen; Jay, son of Aladdin’s Jafar; and Carlos, son of 101 Dalmatians’ Cruella De Vil. While they are living on the Isle of the Lost, they attend school to further their education in Evil Schemes and Selfishness, eat leftover slop sent from the United States of Auradon and bask in their parent’s disappointment that they are not as evil as their heritage. When a sudden break in the dome causes a temporary lift on the use of magic, Maleficent’s talisman is brought back to life and it’s only Mal who can find it. She cons the others to assist her on her journey to the Isle of the Doomed where her mother’s former castle lays and their misadventure turns them from frenemies to tolerable acquaintances. The second novel, Return to the Isle of the Lost, picks up after the film where the four are sent to Auradon to attend school in an order by King Ben, son of Belle and Beast, who wishes to prove that there is more to them than their evil parents. Despite defeating Maleficent’s attempt to steal Fairy Godmother’s wand and release all the villains from the Isle of the Lost, Mal and her friends find out that her mother might not be under lock and key after all – and neither are the rest of their parents. They must journey back to their former homes in search of their families and try to resist reverting back to their old ways. The recently published Rise of the Isle of the Lost is the third novel in the series. It introduces a few more villainous children including Uma, daughter of The Little Mermaid’s Ursula, and Harry, son of Peter Pan’s Captain Hook. While Uma’s former friend is enjoying the life of royalty in Auradon, Uma is plotting her own way to get off the island, and that includes finding her mother’s gold shell necklace and retrieving King Triton’s trident. It’s a race of who will get to the trident first – Uma or Mal – and if good will once again overtake evil or not. Each novel paints a picture of life after the classic films that have served generations and gives a new generation a new story. From reading about the daughter of Maleficent to the son of Belle, with sub stories of the son of Dopey to the daughter of the Fairy Godmother, nearly every Disney film makes an appearance. The stories accompany now two Disney Channel Original Movies and blend perfectly from one plot to the next. The emphasis on adventure grabs the reader from the get-go and the emotion of loving to hate villains keeps the pages turning quickly. Melissa De La Cruz is on to something with this next generation of Disney characters. Where the next chapter leads can be guessed after watching Descendants 2, airing on Disney Channel now.